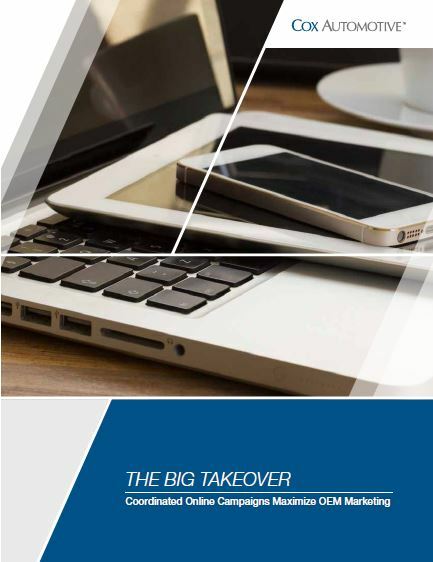 The Big Takeover: Coordinated Online Campaigns Maximize OEM Marketing - Cox Automotive Inc.
OEMs should consider an upfront marketing strategy to facilitate maximum timely coordination across third-party sites, social media and dealership websites. Prominent sponsored content across the homepages of third-party sites is the most effective primary tactic of a coordinated online marketing campaign. Social media ads, editorial content and retargeting can significantly boost campaign performance. This case study shows how two OEMs used digital advertising takeovers of third-party site homepages combined with well-timed multi-tier ads, editorial, social media content and retargeting to accelerate make/model awareness and engagement online. Learn which online marketing tactics were most effective at influencing shoppers at multiple touchpoints during the consumer car buyer journey, from research and shopping activities down to conversions at the dealer level. Each OEM implemented an initial takeover of the Autotrader and Kelley Blue Book homepages, followed by a well-timed blitz of make/model-focused digital marketing tactics that dramatically increased brand/model awareness, shopping interest and multi-tier engagement while significantly boosting each model’s competitive advantage within their respective vehicle segments. Campaigns should focus on a single vehicle model for best results. Prominent sponsored content across the homepages of third-party sites is the most effective primary tactic of a coordinated campaign that should be supplemented with ongoing ads, editorial and videos across third-party, OEM and dealer websites. Coordinate/communicate across tiers to prepare Tier 3 for increased volume of VDPs. VDPs with better merchandising create a better shopper experience and help more conversions to sales. Feature “Search Inventory” as an effective, prominent call-to-action on Autotrader. While creative elements used by the OEMs in this case study varied across tactics, research has shown that campaign performance can be improved when imagery and messaging across all placements have a consistent look and feel. Cox Automotive’s advertising solutions are effective at influencing shoppers at multiple touchpoints during the consumer car buyer journey, from research and shopping activities down to conversions at the dealer level. Download the full case study to learn which online marketing tactics are most effective at influencing shoppers at multiple touchpoints during the consumer car buyer journey.